I am seriously pissed off with the on and off load shedding in Bangalore. Just the moment you set your heart on watching an episode of your favourite serial, light would go out and come back exactly after the serial ends. Upon shifting to Bangalore, initially when we didn’t have the inverter installed, many a sleepless nights were spent due to such unexpected power cuts. Once during monsoon, there was a power cut for two days at a stretch. Unable to sleep at night we booked a room in a nearby hotel to sleep peacefully so that we could gear up for the next day's tight schedule. Inverter seems to be a sacrosanct need in Bangalore. 1) Cut the boiled eggs into two halves. Rub salt and turmeric powder on them. 2) In a blender, make a paste from onion, green chillies and celery. 3) Heat oil in a wok. Brown the eggs and keep them aside. Into the same oil, add mustard seeds and allow them to crackle. 4) Add the paste made out of onion, green chillies and celery. Sauté the mixture for 2 minutes till it turns translucent. 5) Add milk, salt and pepper powder. Simmer the gravy to a boiling a point. Add water if required. 6) Slide in the browned eggs. 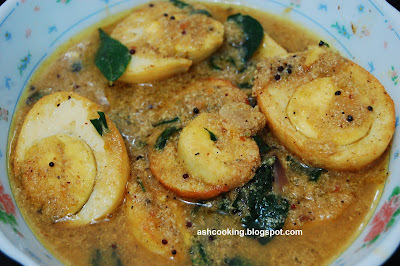 Sprinkle the chopped curry leaves on top. Stir in. 7) Simmer on medium heat for 1 minute. Serve hot.